Has everyone heard about Boeing’s so-called self-cleaning lavatory prototype? Sounds great, but there’s some false advertising here. (It doesn’t actually clean itself. It sanitizes, which is totally different.) But it’s still a good idea, and the inevitable question is… why not do this on the entire airplane? The answer is “economics,” but there’s a company, Germfalcon, that’s working on the idea. I talked to them to get a better understanding of what this does. What Boeing is proposing is a good idea. When people leave the lav, UV light turns on to kill all the bacteria in there. This doesn’t actually clean anything. (Sorry, flight attendants.) Paper towels scattered on the floor won’t magically disappear. And that drunk guy who barfed in the sink? Nope, that’s staying. But the UV light zaps all the bacteria, so at least that barf is now 99.9 percent bacteria-free. Combine that with the no-touch fixtures and it’ll be much cleaner in that lav than it is today. It still, however, doesn’t touch anything outside the lav doors. We’ve all probably seen some obnoxious network news exposé where some dude with a blacklight shows the horrors of your tray table, your seat, and yes, the pillows and blankets that used to be on airplanes. So if you can sanitize the lav, how about sanitizing everything? Of course, this is a lot harder to actually do. It’s one thing to build in a UV light into a small space like a lav, but you can’t really do that on an entire airplane. So that’s where Germfalcon comes in. These guys have built a crazy robot to do the work. This thing looks like it might be on the front line in the coming robot uprising, but assuming it doesn’t turn on its masters, it’s actually pretty cool. It’s designed to go up and down the aisles, taking about 20 minutes to cover 30 rows. The idea isn’t to run it for every flight, because that’ll never happen. But running it at night when an airplane has some downtime is entirely possible. Just because something is possible, however, doesn’t mean it’s going to happen. These things aren’t cheap. (Thousands of dollars per robot…) Who buys them? The airlines? The airports? And where do you store them when they aren’t saving the world from Zika? There are certainly some logistical issues. Let’s say that can all be figured out. It seems like the world would be a better place with germ-free airplanes, so shouldn’t this happen? The economics make it a challenge. After all, people might like it, but I don’t know anyone saying “I hate Airline A because I always get the plague” or “damn Airline B for giving me Ebola.” People just don’t internalize that there’s any risk at the time of booking. They don’t make purchase decisions based on it. For that reason, I think it’s going to be really hard for airlines to justify buying this. Same goes for Boeing’s lav, though I don’t know the cost particulars of that. If it’s cheap enough, it might be a cool gimmick to market. But then again, if you’re just marketing a germ-free lav, doesn’t that make people start wondering about the germs everywhere else on the airplane? Hopefully we see some of this in action at some point. In the meantime, just try not to think about all the germs that live free on your next flight. 12 Responses to Self-Cleaning Toilets Sound Great, But Why Not the Entire Airplane? Interesting thought…but not entirely novel. We use the UV monster in the hospital to sanitize certain rooms where a patient had certain types of infections. But otherwise a good scrub down is sufficient and does the trick between patients. So we don’t actually use the UV machine in every room every time. Ultimately, the BEST means of preventing disease has been and continues to be excellent hand washing and getting your vaccines. The rest is just extra. Unfortunately, the barf left in the lav by a drunk won’t be germ-free. UV light doesn’t penetrate opaque objects in the barf, including the liquid portion. UV also won’t get to the surface under that paper towel on the sink. Nor is it likely to reach the fingertip area inside the door pull. UV in airline toilet rooms may be a good, inexpensive marketing tool, but I don’t think it will actually do anything to prevent the transmission of disease. THANK YOU! Good god Americans really have their priorities in the airline crapper. Or – and this is a super novel idea – perhaps the cabin crew could perform periodic lavatory cleaning. Crews do it on many non-US carriers. Issue latex gloves and a spray bottle of Clorox Clean-Up and mandate that it be done every four hours or something. This would no doubt horrify the 40-year battle axes on United and American, but as they’re so fond of reminding us, they are “here primarily for your safety,” and public health certainly falls in the realm of safety, no? 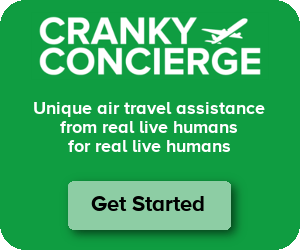 Many airlines already mandate the lavs be monitored and picked up. Bleach is considered a “hazardous material” so your Clorox idea, while a “super novel” one, isn’t an option. Here’s another one, how about people like yourself cleaning up after themselves rather expecting others to do it? Also, what does age have to do with it? Respect your elders foo. They probably could clean circles around any of us. The UV in the lav may be ok, but that robot in the plane is dumb. It would only benefit the first load of passengers who would be spreading their filth and germs on that first flight, and all passengers after them would be adding to the germ field. So why spend all that money to make the aircraft germ free for only the first flight of the day. So the first flight would be germ free, but the follow-on flights would still have fewer germs, since it would only have that day’s accumulated germs instead of many days’ worth. Does the robot flip down or pull out of the armrest each tray table? Because the more worrisome surface is the one I put my food on, and that one wouldn’t be exposed in the closed configuration. My severe peanut allergies mean that as soon as I board, I put my laptop bag in the overhead, put my carry-on in an adjacent seat, pull on nitrile gloves, and wipe all the hard surfaces down near my seat with Clorox wipes. I contain the wipes in the gloves as I remove them, and the FAs are happy to throw them away for me. For most people, the gloves might be unnecessary, but if each person wiped down their tray table and armrests, etc., at the start of the flight, planes would be much cleaner in general. If you care about these things – and I have to, because of the peanuts – it takes two minutes of preparation (gloves and Clorox wipes in carry-on) and 30 seconds on the plane. No biggie! Yeah, it would have to flip down the tray tables. It’s not a quick process. Two words: Chuck Schumer. No, make that three words: idiot Chuck Schumer.